what is a meme? is a meme a singular instance of a joke; or is the meme the symbol by which the joke makes sense. I think by its common use the latterly construal comes into play. Of course there are some memes which exist which are derivative of other memes which themselves make memes; and memes which are a combination of seperate memes. Somehow, addressing the metaphysical issue would lead us to a discussion of whether one may be nominalist, or realist about memes. Anyway, lets go into observer mode for this post. I thought I’d address two particularly interesting memes. Firstly, there is the Xzibit ‘Yo Dawg’ meme; and secondly, one which perhaps may not necessarily count as a ‘meme’ per se, but I have found it as a pattern. I’ll call this the Jesus meme. Complex sentential operators seem to constantly fascinate philosophers, in the area of metaethics, epistemology and the general area of normativity; there are often belief statements which may be beliefs themselves, or complicated psychological functions which involve multiple linguistic operations. I always think of the epistemic example of the episode of Friends where, in a cat and mouse style to hide the relationship between Chandler and Monica; the statement is uttered: they don’t know that they know that we know. Such complicated belief phenomena is often difficult to logically unpack. Also, I find a crude joy in the sheer complexity of a statement. 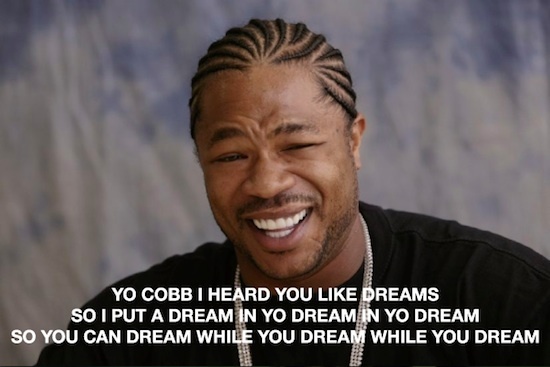 I thought I’d share an example of the Xzibit phenomenon with a summary of the equally complicated film Inception. My favourite one is where Jesus tells a person on a computer to ‘Delete sys32.exe it will make your computer faster lol’. Satire has taken a bizarre level. p.s. don’t delete system32, it will ruin your computer. Aristotle deems that there is a certain systematicity or heirarchical structure to the political order. By political order I also mean the social order. I wonder how a feminist would read Aristotle, we can easily read this as a justification of the social order, or a value neutral appraisal of patriarchal order. We can be even more neutral and see this as a non patriarchal order, but some kind of naturalised system of rule. Aristotle seems to think that the social ordering is a natural phenomenon, perhaps akin to how an ethologist would look at the community structures of animal life. The likes of Dawkins, I presume would disagree, on the basis that it is exactly because of natural selection and the unique composition of homo sapien development, that our previous ancestral tendencies can be overthrown, so that we do not need to see the social order as an extension of some naturalised order of dominion. This is not something I can easily come down on, not from reading Aristotle, or even Dawkins as this is a much wider issue; but Aristotle opens the wound for this issue and the modern reader is left to decide whether to accept this naturalising interpretation or not. 2.2. The family is a unit that serves a function, so says Aristotle; it serves the head of the family, and serves the wider community and state stuctures. Perhaps here, we might even say that Aristotle was the first social theorist! It is here that later social theorists have theorised about the superstructure of society. Althusser would say that there are subservient aspects of society which ultimately serve the prime motive of society; supporting the ruling class and its economic system. The family, education, commerce and perhaps even religion, are all part of the ‘telos’ of the larger social machine. Alternatively, we can go the way of the structural functionalists; like Durkheim or Parsons, and say that society works in the functional manner. Instead of a heirarchical scaffolding a la Althusser; we could consider the political order as an organic being, with components that serve functions (telos). Aristotle seems to think that each political organisation has a function, from within (to serve its constituents) and from without (to serve the wider body politic). Contrary to the Durkheimian organic analogue, however, is a a power narrative/analogy. Every social unit, from the family, the community and the state; needs to have a head. The family has the patriarch/master, the community has its leader and the polis has its statesman. This probably seems antiquated to many readers, and my initial thought is that it seems to naturalise the status quo political as some kind of paternal ruler; where ‘Father knows best’. Consider the ‘culture of personality’ propaganda of Stalin; the naturalising of Folk cultural themes in the Third Reich or even science fiction examples dictators like ‘Ming the Merciless’. Aristotle almost reads like prosthelytism to dictatorship. At this juncture I raise the question: at what point does analysis become justification? I sound very negative in this reading, and perhaps more so than I thought I would be before writing this post. Aristotle says something like: ‘A barbarian makes no distinction between a woman and a slave’. I thought this was a very crude and ambiguous phrase. One thing because it almost sounds like ‘The Philosopher’ is making a positive claim about the political status of women. The hell he isn’t. Going back to the ‘telos’ discussion of 2.3; Aristotle seems to think that the optimal telos of an object is that one object should have one function only, and no more than one. Perhaps I’m misreading here as I am thinking of the analogy of the ‘Good knife’ contrasts with this analysis. I think Aristotle is trying to say that having only one function makes the political unit function properly. A ‘civilised’ family unit should have a wife unit that functions for producing children, but domestic tasks would be performed by slaves (of course note the casual acceptance of slavery in this period). A labourer class would produce future labourers. It would be a sign of doing too much, and social disorder if an individual performed too many functions, thus ‘A barbarian makes no distinction between a woman and a slave’, I think the most charitable way of looking at this is some bizarre formulation of the perils of the work/life balance. Let’s talk about Talcott Parsons. People in the 20thC talk about social changes as if it means social decline. Over the 20thC in the US and to some extent, Northern Europe; typical social strata were undermined. In the UK traditional industries concerning primary resources like mining, fisheries and industrial production were closed down for various reasons; leading to the destruction of old local certainties and family traditions of sticking to a single professional trade. For various reasons, religion loses its influence and the nature of social relationships have significantly changed; family structures are not necessarily predominantly two parents, married, heterosexual or m/f. Alternative structures emerged, alternative spiritualities and religious practices emerged (including: none, humanism and apathy). Social structures change, and so do their functions. It might be exactly because of their change of function that they change their social influence. As a concluding remark. Although I’m not reading Aristotle in a serious exegetical and detailed manner; there is so much in so few lines that begs of analysis and discussion. I think I now understand why some ‘Continental’ philosophers have turned to Aristotle for their insights. I suppose it is only natural for one who wrote on so many topics, that he would have resonance to the modern social sciences. Perhaps the social order can be read in metaphysical terms. Metaphysical because the social system concerns ‘ontology’ (what is there) and ‘mereology’ (the relation of parts to the whole). Aristotle is truly systematic in that these metaphysical elements compose the social order. Its one thing to naturalise social order; but what if we used naturalised metaphysics to analyse the social world? I think the medieval in me would absolutely love this prospect. Of course this raises just as many questions and general objections about metaphysics and naturalised metaphysics in general. However, mereology and ontology find their utility here, if philosophy is anything; it is the use of as few concepts as possible to explain the most. Metaphysics might do some good here. I suppose this sounds slightly heretical, and ‘continental’. I’ve attempted several times to read Aristotle’s Categories. I’ve always put it off, as one of those books I’d read at some point in my life but never end up getting to read. My old Aikido teacher used to say something about difficult techniques which went something like: if you don’t do it now you’ll never do it. Without pondering that too much, sensei seems largely right. I’m halfway through categories, and I thought of a few remarks of what I did actually understand of it. 1. The success of Aristotle’s ‘Categories’ is exactly in how ontology light this text is. One can easily read this text in terms of the linguistic components of understanding reality; that is to say, the fundamental categories of quality, relation, etc. are semantic properties which are useful heuristics to understand the world. 2. There’s a lot which seems so uncontraversial it is basically a word game. A double and a half are terms which are inherently defined to have relations (presuming its double-of or half-of the same unit). This kind of simplicity is important for philosophical treatise so as our data on the world comprises at least initially of the obvious. 3. Aristotle’s Categories can be read as a work of philosophical analysis, to assess the world in the typology of the categories is to say that these categories are distinctions worth making. Largely, they are. 4. Aristotle is claimed to be the spark of inspiration for later theses about categorial understandings of reality. Stephan Korner (another person I need to read properly in my life at some point) speaks of the strength of the notion of conceptual scheme in Aristotle, Kant and Frege’s thinking. I’d perhaps even add Carnap to that list. 5. Perhaps the most mysterious claim to me is the concept of ‘substance’ (Gk. Ousia). Aristotle says that no substance can be predicated of itself, this kind of talk seems dangerously platonic. In a sense I can understand that a substance concept of a universal cannot be instanciated as a predicate form. So “Socrates (man)” follows the “Predicate (Substance) form”. It makes sense to say for instance that one walked into a green wall but not a ‘green’. Perhaps this one important category brings up the fundamental problem that comes up with all categories; namely, we are invariably led to the old problem of universals. My initial reading of Aristotle was of an understanding of typified reality that wasn’t heavy on the ontology side of metaphysics, and more on the analysis aspect of metaphysics; but with substance, we perhaps see the true face of Aristotelian metaphysics. Being drawn into the problem of universals is not in and of itself a resort to unfashionable metaphysics (for one may take a stance of say nominalism or conceptualism), but to not raise the issue at all is to avoid it. I’d prefer the latter route, it’s parsimonious. This post doesn’t venture to make assertions, but raise questions. Most of these thoughts raised from (of course) numerous episodes of Star Trek series (Enterprise, in particular). As some of you readers may know, in the Star Trek Universe; as well as horrific violations of laws of physics; part of the Federation’s way of operation is avoid intervention with life forms which have not reached a certain degree of social and technological advancement. This may involve respecting the laws of civilisations which we may consider abhorrent, or prematurely introducing technologies that are too advanced for the civilisation to deal with safely. There have been occaisions of course, when certain Federation citizens (usually/infamously Captain Kirk as well as the lesser known Captain Archer) have intervened, which leads to unintended consequences, some of which, negative. The notion of non-intervention seems to time and again justify itself by instances when it is not observed. I’d like to consider in this post, instances and issues of intervention. There are many well established issues of intervention within the natural world. Human intervention and the pursuit of resources and industrial production has destroyed faunae and florae on a specii level probably back from the time human’s learned how to sail ships and forge bronze weapons. Statement a. is one which many people would consider to attempt to save species on largely sentimental grounds. It is certainly true that many faunae and florae species have come to extinction as a result of human impact. To acknowledge it is one thing, but to attempt to save such species as a moral imperative seems very curious. What reasons can we, and should we offer to attempt to attempt preservation of such species? Are there good reasons and bad reasons? Furthermore, shouldn’t there be an internal discussion between the proponents of preservationists so as to establish the proper reasons? What if homo erectus was saved from extinction and then homo sapiens was never allowed to flourish? It is the nature of species and system survival, that some species live on and adapt; while others do not survive. The notion of preservation may be an intervention into the development of species. Perhaps homo sapiens is too ambitious to think it plays dominion over other species not only in its action of eradicating species (albeit unintentionally); but in its explicitly intentional efforts to preserve species. it may be pernicious to the future development of species to allow some to artificially stay on in an ecosystem when it lacks the capacity to survive. Perhaps its extinction was inevitable. To preserve a species may be the cruel option. If we are to preserve a species, I would ask, ‘who are we preserving it for?’ Ourselves? our smug sense of sentimentality? or the wellbeing of the species and the wider biosphere? Either way, preservation or not; we have no option of nonintervention here. Perhaps theories of natural selection may advance if we come across other living forms beyond earth. Perhaps they have naturally eradicated most of the species that they could not use either domestically or that they didn’t care enough to preserve. The issue of intervention with other life forms on earth has become complicated in relation to the notion of how biological systems face natural selection. It is like the complication of the observer in social research recognising that she is herself a member of the social phenomenon, and her intervention diminishes the findings of the research. Homo sapiens is a result of natural selection, and what happens next with other species, will be part of the narrative of how natural selection develops when one species has such influence over other species and systems that their very mortality lay in humanity’s balance. This is a slightly different, but related question. Most people did not have any moral compunctions towards eradicating smallpox, and I’m certain that many people would like to destroy the common cold, or HIV/AIDS. Human intervention seems inevitable on such microbes as they pose a great threat to many people. While adaptation occurs, modern medicine has found ways to counteract the waiting process of a thousand or so years to develop immunities. Is modern medicine a nuanced form of genocide toward these viruses and microbial level species? One might ask, why is it that its bad to put the Panda near extinction but no one considers smallpox? How far does one go in a justified degree of intervention? I thought I’d put in a musical interlude. Here’s something neat and Norwegian. In this post I’d like to consider something slightly different, but prolegomena questions on the issue of evil. Here’s me setting my terms. It has been said by a few Kant scholars (Wenzel et al), that Kant’s analysis of the judgment of beauty or aesthetic judgment proper, can also apply to other aesthetic responses. When Kant describes the judgment of the beautiful; he elicits certain features about aesthetic judgment in general; we engage in an ‘as if’ universal language when we communicate something like ‘that second act was the most beautiful of the whole opera’. We also impute that others must agree, or if they disagree, attempt to enlighten us on the failure of our aesthetic judgement. Kant made much effort to analyse the psychology of judgments of aesthetic merit. Some ask, what about aesthetic demerit, or disgust? Those also answer that Kant’s systematic approach can also be used to elicit features of aesthetic demerit. Although the literature on ‘disgust’ and ‘terror’ has taken a furn of its own in the continental literature. Can such a systematic isomorphism take place between the ethical appraisal of the good, and evil? I’d like to think so. To consider Evil as something else from the Good; makes the world of ethics and metaethics a little more broad. Broader still would be to consider phenomena such as moral character, moral dispositions and moral reactions within the domain of ethics proper, but that’s an argument for another day. To make the claim that Evil may be treated in isomorphic fashion to the Good raises the question of what properties there are that can be mapped on to evil that can also describe the good? Here is where a more meta ethical approach may ensue. When we talk of the good, we may consider issues of how knowledge of morality may arise. Do we for instance, percieve something as immoral viz some sentimentalist and non rational response? Or perhaps do our moral responses (and thus moral appraisals) come about in a wider framework of propositional beliefs; motivations (whether internal or external to belief); dispositions and justifications. To speak of evil philosophically is to address the whole domain of ethics and metaethics; similarly we might say the same of the good. What matters is the import of our underlying understanding of what it is to believe in, act toward, or establish moral judgments. I have always maintained that substantive moral issues can be informed by cultural phenomena. Learning through the likes of Shakespeare or DC Comics can give us a picture into insights about people. Evil is no different. Assuming that we wish to enter the talk about Evil into our philsophical vocabulary, we can gain as a great resource the annals of popular culture or our historical past figures who have written on evil. Nietzsche and philosophers influenced by him, often have interesting things to say about good and evil. Characters we may understand as archetypes, such as the Joker, or Ozymandias (Watchmen) may give us greater nuances, toward systematic and typified conceptions of evil. One most amusing (and insightful) construal of evil comes from the Dungeons and Dragons alignment system. Normally we consider good and evil as two poles. But what if it were more complicated, and the distinction also included our adherence to law and order. So, someone could be good, but lawless (e.g. Batman), or evil and lawful (oil companies?). Navigating through pop culture apocrypha and religious traditions will inevitably lead to contradictions and blind alleys in our understanding of evil. Its up to us as systematisers to demerit some perspectives over others in the name of truth an analysis. Navigating through cultural relics can also help enlighten us on evil as a notion. Social Science: Change the definition of evil, or give it an operationalisation. Criminology is the study of evil. At the edges of crime we might ask certain questions that are outside official criminal definitions. Why is it that industrial accidents in some cases have no criminal definition? Why is it that environmental damage (an evil) is not taken to be enough of a criminal matter? Consider egalitarian matters and social justice in terms of evils; within the framework of operationalising and research questions, the salience of ‘evil’ as a concept can be worked out through a great many questions about society. Some are about solid issues that are definately empirical (rates for reported crime); some are questioning of our current discourse (redefining crimes into non-crimes, or vice versa). Some are critical of our dominant powers (corporate and white collar crime, whether governments should be accounable for breaking international laws or economic damages). I’d go out on a limb here and say it is the essence of social improvement to operationalise questions and topics of research, as well as the following findings and theoretical musings that follow from them, to be in the remit of social and overall humanitarian betterment. Psychology: Here’s perhaps where evil gets questioned the most. Case studies into psychopathies tend to lean toward giving exceptions to moral culpability in severe trauma cases (Patricia Churchland likes to consider these kinds of cases for instance). Can we understand evil in terms of deviance? What if we understand evil as a fundamental privation? What if, we may sum up a variety of phenomena to parsimoniously be considered in terms of evil. I think this issue is a moot one, and psychology may trump evil out of our ontologies. I still maintain, despite this, that operationalising one’s terms and research questions comes to the fore in defining conditions for success of a piece of research, as well as its criterion of success at answering the respective question. Culture/Religion: Culturally speaking, Evil is a term that has been used for so long, we can make a language and set of cultural totems toward it. There might be another X-men remake with Magneto or other such villains, but they make sense presuming that there are ‘good guys’ and ‘bad guys’ and ‘people in between’. It’s been part of our thinking for so long that we might as well use it as a term. In terms of religious traditions, and in my experience in interfaith groups; Evil is the one thing that unites even the atheists with the religious. Statements of opposition towards evil, or unified condemnation brings unity to groups that are often emphasised for their difference or disagreement. Having common terms helps communicate the same thing. I’m not certain whether Evil should be part of our vocabulary, but to bring it in, allows possibilities of asking and answering questions. One question that I’ve still considered without an answer for a couple of years was raised by a seminar I was in; of whether the fulfilled person may be amoral or immoral.